Needles + yarn = INFINITE POSSIBILITIES. 1. Anyone can be a knitter, and anything can be knitted. 2. And the best people in the world are knitters. 3. Knitting, and the time you spend doing it, is priceless. Still haven't forgiven my little sister for the time I knitted her a beret only to find that she later went out and bought a nearly identical version at Urban Outfitters. NEVER AGAIN. 4. Although bartering is a different story. 5. Always get the good stuff. Acrylic (arguably) has its place, but there's no better feeling than pressing a squishy pile of silk-merino against your face. 6. The joy of a completed project is only matched by the pain of an unfinished one. Although there's no harm in having several different projects going on at the same time; sometimes it's fun to switch them up, and leads to all kinds of new ideas. 7. Stashes are deeply personal. Never let yourself be stash-shamed, no matter how large or small it may be! 8. Knitting is incredible therapy. Something about the rhythm, the calm, and watching these tiny stitches add up to create a tangible result makes you feel like you can handle pretty much anything. 9. And helps you channel your emotions. Although you could do a fair amount of damage with some Addi Turbos...just sayin'. 10. 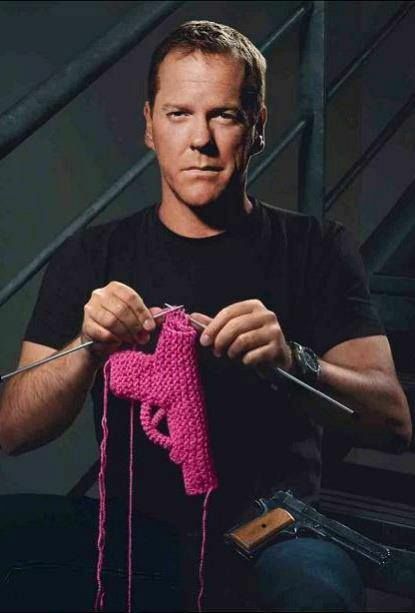 Knitting skills can come in handy in the strangest circumstances. Crafters of all kinds have always been absolutely amazing at rallying in times of tragedy and need, and they're unrivaled when it comes to thinking outside the scarf, as it were. 13. Live on the edge. Or don't, and save yourself from a lifetime* of pain and suffering down the road. 14. Step away from the internet. Just as soon as you've emailed yourself that one last Knitty pattern. And updated your stash on Ravely. And pinned three or four dozen... oh dear. 15. Crocheters totally know what's up, too. There will always be people who'll make fun of what you're doing or just won't understand it, and there's not enough time in the day to spend engaging with them. Insults run the gamut from "old lady hobbyist" to "hipster bandwagon jumper" with total disregard of the fact that there are as many different kinds of knitters in the world as there are people (to paraphrase my favorite childhood book, Harriet the Spy). Just smile and nod and knit another row while they waste their time judging how other people spend theirs. Besides, you'll be the one laughing when said haters FREEZE TO DEATH because they don't have any cozy handmade mittens/gloves/sweaters next winter. 17. So hold your head high and keep doing what you're doing. 18. Because while knitting may not solve all your problems, it definitely makes them feel a whole lot less pressing.